Trevor Larnach made his debut for the Cedar Rapids Kernels tonight, and did so with an impressive game at the dish. Up a level, Lewis Thorpe spun a great game from the mound to position the Lookouts for a victory. In a busy night on the farm, there was plenty to write home about. Image courtesy of Image courtesy of Seth Stohs, Twins Daily (photo of Lewis Thorpe? Nick Anderson worked as the opener in this one, and surrendered three runs on four hits while generating one out. Chase De Jong then came on as the starter and turned in five and two-thirds innings of solid work. He allowed just one run on three hits while walking three and striking out five. After getting into a 3-0 hole in the first inning, the Red Wings were tasked with battling back. Down 4-0 in the fifth, they did just that. Jeremy Hazelbaker drove in Juan Graterol with a single, and Tyler Austin plated Hazelbaker on a single of his own. A sac fly from Willians Astudillo made it 4-3 when the inning came to a close. Astudillo also successfully pulled off the second Red Wings hidden ball trick of the year. In the seventh, Kennys Vargas clobbered his 14th homer of the year, a two-run shot that also scored Nick Gordon. In the eighth, Gordon drove in Taylor Motter with an RBI single of his own to make it 6-4. Alan Busenitz locked down his sixth save of the season by working a flawless ninth inning. The Red Wings will wrap up the series with Toledo tomorrow night. Lewis Thorpe was on the bump from the get go for this one, and he turned in five solid innings of work. Allowing just one run on three hits, he fanned six and handed out just three free passes en route to his eighth win of the season. Scoring started in the second inning when leadoff batter Zander Wiel singled to center field. The hit scored Luis Arraez and Jaylin Davis to give the away team a 2-0 lead. After Jackson drew closer in the fifth, Brent Rooker pushed the Lookouts back to a two-run lead with his 21st homer of the year, making it 3-1. Jimmy Kerrigan followed up with a two-run blast in the sixth making the score 5-1 Chattanooga. Jackson was able to scratch two runs across in the ninth, but the lead held at 5-3 and the Lookouts remained victorious. Game two of the series will take place tomorrow night. Clark Beeker toed the rubber for Fort Myers in this contest, and despite lasting six innings he surrendered five runs (four earned) on ten hits. The offense was able to push just one run across despite tallying nine hits, and the away club fell by a 5-1 tally. In a 3-0 hole after the first inning, Fort Myers found themselves backed up against a wall early. Robby Rinn tried to help claw back into things with a sac fly in the second that scored Alex Kirilloff, but unfortunately that was the lone Miracle run of the evening. Fort Myers took the series by a 2-1 tally, and they outscored Lakeland 18-0 in the first two games. Unfortunately, game three didn’t go their way, and they’ll look to rebound against the Fire Frogs tomorrow night. For the Kernels, Tyler Watson was given the starting nod in this contest. He turned in five innings of solid work, allowing just two runs on two hits. He matched both his strikeout and walk totals with four apiece. Cedar Rapids jumped out to an earlier lead thanks to a leadoff homer from Akil Baddoo (his 10th), and an RBI single from Michael Helman. The Kernels held that 2-0 lead until the Lumber Kings knotted things up in the bottom of the sixth. Jacob Pearson then blasted a grand slam, his fifth homer of the season, in the top of the seventh to put the good guys back in front. Clinton tallied a run in the ninth, but it wasn’t enough to overcome the four run deficit. In his Kernels debut, Trevor Larnach finished 3-for-4 with a double. With the win, Cedar Rapids owns a one game lead in the series and the two teams will battle again tomorrow night. On the mound for the E-Twins in this one was Tyler Palm, and he turned in five solid innings. Scattering eight hits, just three runners crossed the plate and no free passes were given. Kingsport led 3-0 through the first two and a half innings, but the E-Twins came storming back. Lean Marrero picked up his fourth double to score Ricky De La Torre and get the good guys on the board. Jean Carlos Arias then followed with a ground out that plated Yeltsin Encarnacion. Down 3-2 entering the bottom of the 9th inning, De La Torre played hero. A single to left field drove in both Trevor Casanova and Colton Burns allowing the home squad to walk it off for the win. Elizabethton will host Bluefield tomorrow evening. Tyler Benninghoff got the nod in this one, and he turned in five innings of solid work. Allowing just one earned run (three total), on three hits, he had his team in position for the win. Agustin Marte hit a solo shot in the first to knot things at one, and the GCL Twins tallied two in the second to get their first lead of the contest. Estamy Urena scored in the sixth, and Marte crossed the plate in the seventh, adding another two runs for the Twins side. Up 5-3, that’s where this one wound up. The Twins side will be the away squad tomorrow as the same two sides do battle. Oh, a good game for Gordon. More please! I wonder if there's enough time for Rooker to try out AAA? And maybe we can get Austin up here before September? That'd be nice. Transaction: JT Perez promoted from GCL to Elizabethton today. I really think it’s time to promote Thorpe to AAA. 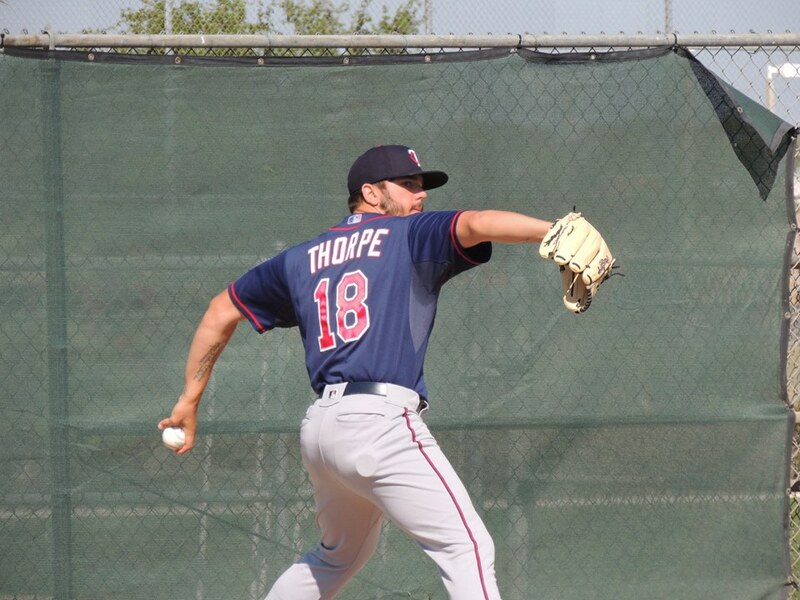 I mean for the most part of June, all of July, and into August Thorpe has pitched exceptionally well. I mean in his last 10 starts (thanks to milb.com) Thorpe has an ERA of 2.09, and his ERA in the second half of the season (again credit milb.com for the stats) is 1.99(!). Also to judge Thorpe’s improvement consider he now has more innings pitched than hits allowed, and has dropped around 100 points off his batting average against (he had an opponents batting average against over .350 earlier this season and now it is .251). I think now would be as good time as any to see what Thorpe can do (even if it is a start or two given his innings count this year) in AAA and start him in AAA next year. Is there a logjam happening? Would the Twins be better off jettisoning people ike Santana, Morrison, Bobby Wilson, Forsythe, maybe seeing if someone grabs Addison Reed, not to mention a couple of bullpen arms just so you can move 3-5 people up NOW from Rochester, then same number from Chattanooga to Rochester etc. etc. Is it worth it for players to play at a higher level for a copuple of weeks? It's getting late, but I agree, shouldn't Rooker at least get a couple weeks at AAA to help get ready for 2019? I would love to see an audition in September as has been discussed, but the reality is a year and a half of pro ball and 40 man roster decisions that he doesn't have to be included in. But tell me who is really blocking him for said experience? He should be promoted tomorrow, get a taste, get invited to 2019 ST, and then, probably, begin the season in Rochester. Love we are FINALLY looking at Mejia, who I believe is out of options next year. IMO, he has the potential of a 3-4 SP. But his stuff could also play up as a quality/dominant RP if nothing else. Gonsalves, although I expect some early lumps, is probably an even better prospect. When does he get the opportunity to take those lumps and grow and learn? Thorpe probably has even better stuff and even more potential. And we often forget how young he is, and what he has shown, especially considering what injury and illness did to cost him 2 seasons. How about a few starts in AAA to set his table for 2019? Good seeing Kennys Vargas have a game like last night.Expect he is excited to see what team he can sign with over the winter.A team that hopefully will give him a real chance to get 450-500 big league at bats.I have always believed that he can be a solid major league bat...if ever given a real opportunity. And isn't it exciting seeing Thorpe pitch like this as he crosses the +30% innings mark.I see Thorpe, along with Romero, as the next big adds to the Twins rotation, probably starting sometime next year. Another nice 2 hit game for Arraez, but Wiel had 3!I know everyone is excited to see Gordon get 3 hits, but Rortvedt was also 3-4 and all 3 of his were doubles.What a great opening night for Larnach, but Helman also had 3 hits and is now 5-9 in his two games with the Kernels.With all the shiny new toys in the system, we tend to forget about toys that were new last winter.Last night's grand slam is a reminder that Jacob Pearson is having an excellent first full season in the organization. Astudillo's hidden ball trick, with of course the "Assist" by pitcher Chase De Jong, is a beauty. It fooled the PBP announcer too, as he kept asking himself if this was a pickoff or appeal play. "Dawel Lugo out at 3rd, third baseman Willians Astudillo." I wonder if there's enough time for Rooker to try out AAA? It's getting late, but I agree, shouldn't Rooker at least get a couple weeks at AAA to help get ready for 2019? Is there a reason that Rochester continues to employ the "opener" pitcher scenario? The last two times the "opener" has been lit up for 3 runs and the "starter" has come in and pitcher well. Nope. You want to see if you can get something back for Morrison, Forsythe, and Santana - all of whom should make it through waivers (Morrison already has). Wilson has value if you bring up young pitching. You want them working with a veteran catcher, not a guy unlikely to play the position in MLB. Reed is under contract next year and is injured. You'll get nothing for him now. He should be held til the offseason, when he'd have trade value (or can be a key part of the 2019 pen). Gonsalves, although I expect some early lumps, is probably an even better prospect. When does he get the opportunity to take those lumps and grow and learn? September 1st. Plenty of time in September. Wilson is unlikely to play the position in MLB for anyone but the Twins. I get your meaning, though. Wiel is another guy that deserves to go to AAA. I mean, Wilson will be in the same position next year I imagine. Starting in AAA and needing an injury to make it to the majors. So he may never play MLB again but I don't think it says anything about the Twins. Most team's third catcher is a guy like Wilson. Interesting to see what the Twins do next year. Castro and Garver seem like the MLB duo. Is Rortvedt close enough to be the emergency one? I think maybe by July or August but not to start so I imagine we'll end up with a Wilson/Gimenez type. On his Minnesota Sports Weekly podcast last night, Travis Aune interviewed Chris Blessing from Baseball HQ. Hes' been a guest before... but in the episode, he talks about the players the TWins received in all five trades, but then he talked about Thorpe and Kirilloff and several other players. I think you all will be interested in his thoughts on Brent Rooker too. Fast-forward to the 4:00 mark to hear the interview. It's about 15-20 minutes long or so. Good stuff from Chris as he has seen the majority of these guys. He scouts Chattanooga often. He got up to see Cedar Rapids in Bowling Green earlier in the year. He gets to E-Town and the Appy League quite a bit too. Please correct me if I'm wrong but I didn't think the Pitcher could be on the mound at all, let alone about to step on the rubber, if he didn't have the baseball??? Nice to see Gordon have some nice games in AAA. Is Rortvedt close enough to be the emergency one? Progress this season but still multiple years away. He's still not even 21 yet, no matter how hard he's pushed. I agree with everyone, he should be in AAA now. Yeah, he'll start in AA next year. By midseason he may be in a place where he could cover a ten day DL stint. That's if everything goes well of course. This is such a Twins thing. Is there any other team in the league that has such a ridiculous development policy? Carlos Correa had three birthdays in one season, if I recall correctly, and yet here are the Twins insisting that their players age one year at a time. Ridiculous. He won't be on the 40 man next year, so I highly doubt he's going to be the guy to cover a DL stint unless they only keep 2 catchers on the 40 man. Thanks for the link, Seth.Enjoyed the interview! That's what I thought too. There is also a rule that the pitcher cannot stand near the rubber without the ball (it's a balk). I think the umps screwed up because they got surprised by it too.